BRENHAM – The 47th annual South Central Texas Cow-Calf Clinic and Trade Show is set for Oct. 26 at the Washington County Fairgrounds Sales Facility in Brenham. Registration is $20 and begins at 7:30 a.m., with the program getting underway at 8 a.m. Registration includes lunch, afternoon social and entry to win a commercial heifer at the conclusion of the day. Participants must be present to win. The event is sponsored by AgriLife Extension and beef and forage committee members from Austin, Brazos, Burleson, Fayette, Grimes, Harris, Lee, Waller and Washington counties. 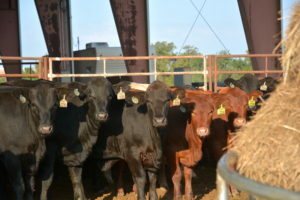 Matheney said the afternoon will feature a Texas Beef Council update and the remainder of the day will focus on Understanding Cattle Behavior and Low-Stress Cattle Handling Demonstrations. New for this year is a youth program. Registration will be limited to the first 100 students and is open to youth in the multi-county area. In addition to the trade show, ranches and cattle producers are invited to display their cattle at the event. Display pen fees are $50 per pen limited to one bull or three heifers per pen. Anyone interested in bringing cattle for display is asked to contact the AgriLife Extension office in Washington County for additional information and details. After the meeting, trade show vendors, participants and speakers are invited to a social hour sponsored by Mike Hopkins Distributing and enjoy beer-battered beef tips. Participants who hold a private, commercial or non-commercial pesticide applicators license will receive one hour of continuing education in the integrated pest management category. For additional information and to register, contact the AgriLife Extension office in Washington County at 979-277-6212.